All roads out of Bucharest are closed. 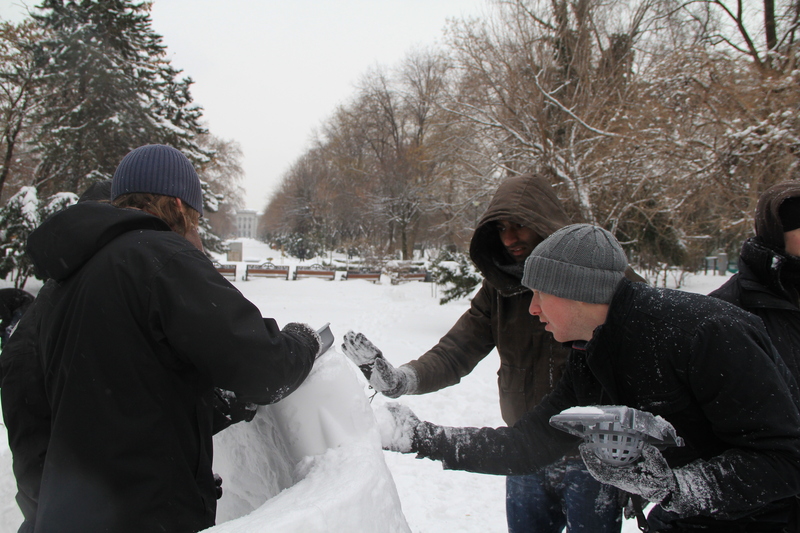 The first heavy snow of the season is proving a challenge, even for seasoned Romanians. 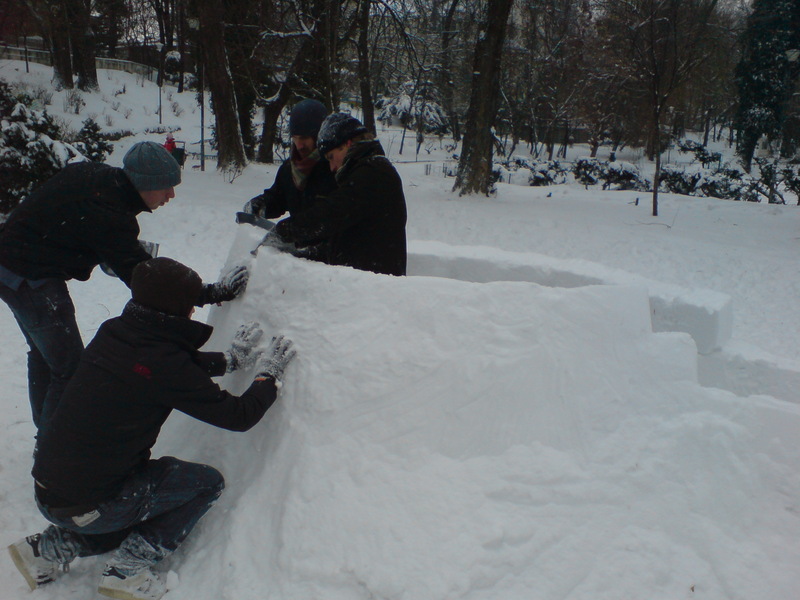 As the locals continue to persevere with their daily business, a group of marooned IARD (International Architectural Regeneration & Development) students turn their attention to the virgin snow of their nearest park. The awe inspired by the conditions varies, from grumbles of cold feet to the excitement of experiencing snow for the very first time. 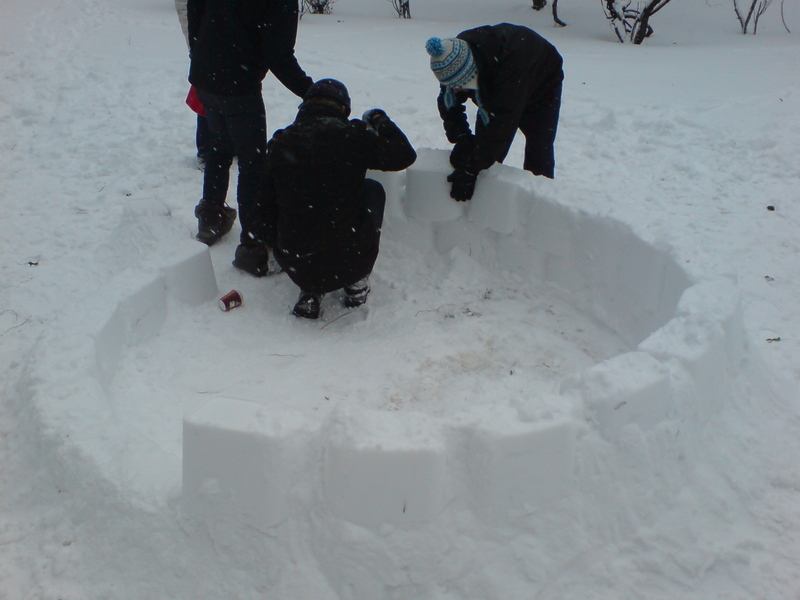 Amidst the musings somebody mutters the word ‘Igloo’ and the challenge becomes clear. 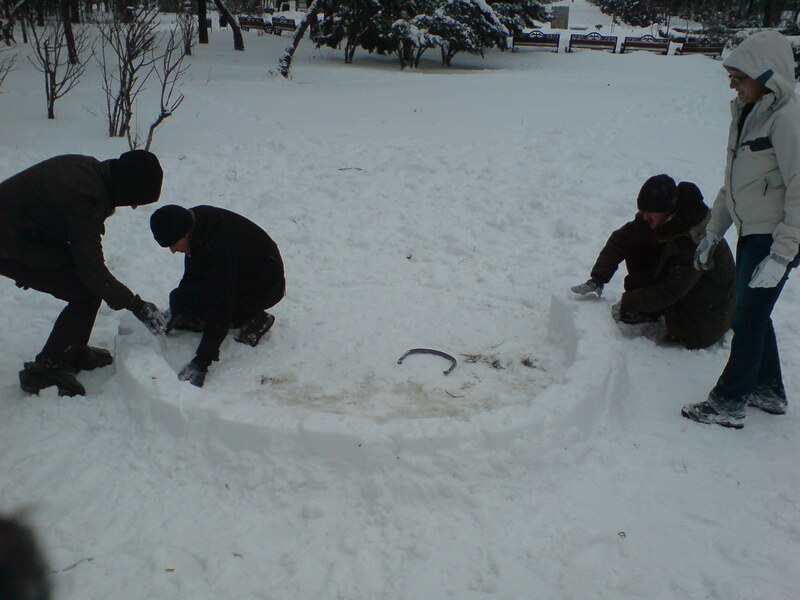 Without the conditions to cut blocks of ice in the traditional manor it is decided that a mould would be required to generate building blocks of compacted snow. Adapting to their environment, the students set about sourcing the appropriate tools. 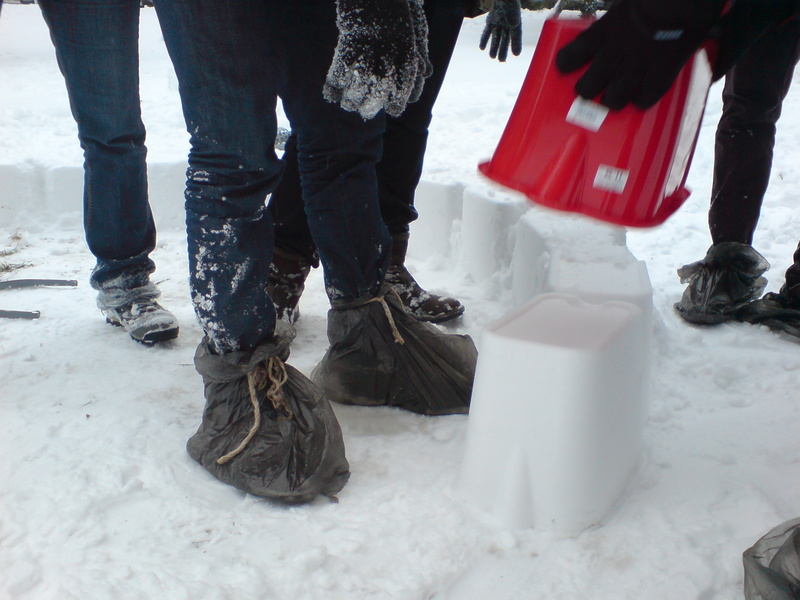 Yards away from the site, a corner shop yields results in the form of a mop bucket and dustpan, tools that turn out to be highly suitable for adhoc, urban igloo construction. 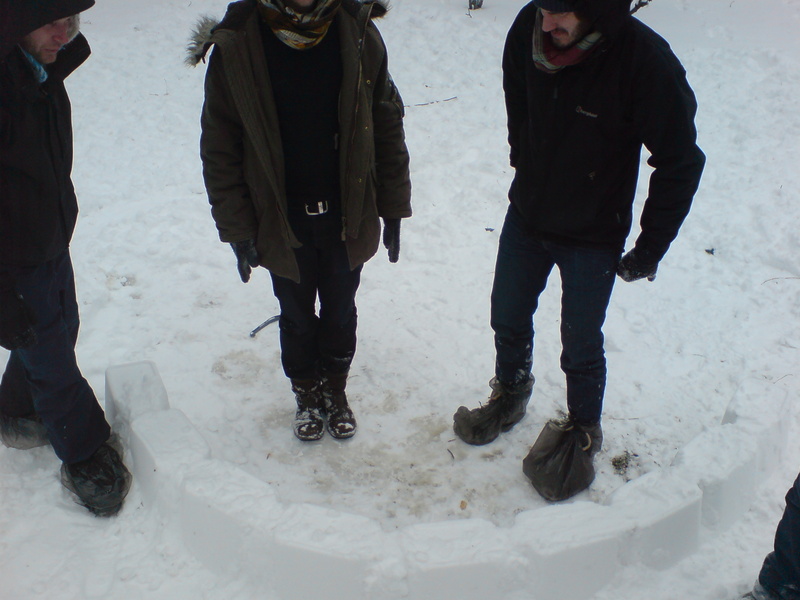 Theorists among the group express concerns over the dislocated vernacular of the Igloo, answered by questions of the very definition of vernacular and whether it need be historical or even traditional at all, whether local materials, tools and craftsmanship are equally defining. 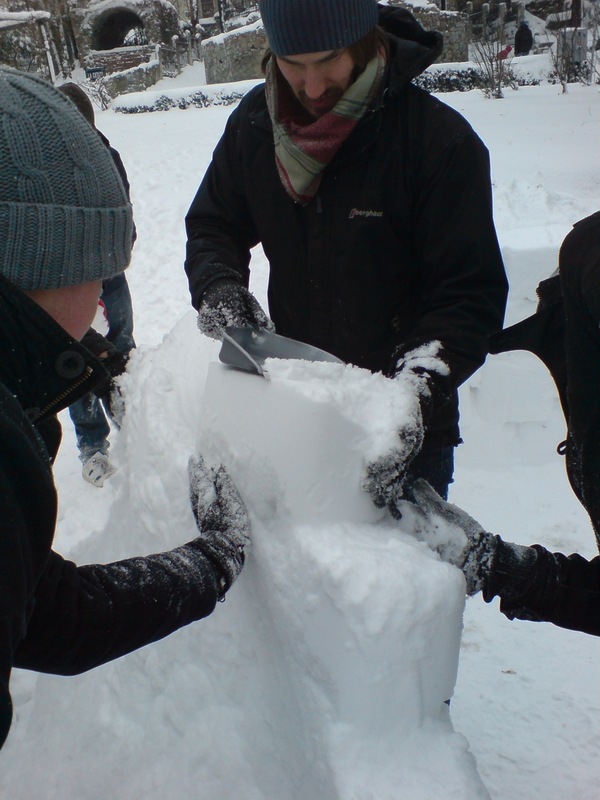 Following the successful casting of a test block, an area of snow is cleared and a rough circle is drawn with a diameter somewhere between an optimistic ten feet and a sceptical five. The first block course acts as a calibrator for the block casting technique which quickly becomes the first skilled role on the build. Certain attributes of the process, including the several rounds of compacting during the bucket filling and the desired smooth finish to the base of the block become the coveted intricacies of that particular craft. The second skill to emerge is that of mortaring between blocks and preparing for the next course, something that requires patience and a gentle hand. Master builders start to emerge in the various trades just as team members begin to falter and retreat to the warmth of the hostel, in the fast paced training and handing over of tasks, the knowledge and experience of the craftsmen is apparent in their protectiveness of the correct technique. As construction speed increases with the confidence of experience it becomes clear that brick production needs to be accelerated. Much to the dismay of the group’s would-be quantity surveyors, the decision is made to double the build cost to almost twenty five Romanian Leu (five pounds) with the purchase of a second bucket and dustpan. With the height of the structure escalating there is growing concern over the prospect of angling the walls into a roof to complete the dome. The need to decrease the size of the blocks becomes apparent but without a smaller mould it is necessary to cut the blocks insitu, the process of resizing offers the opportunity to chamfer the top of each course providing the desired angle to start leading the walls inwards. 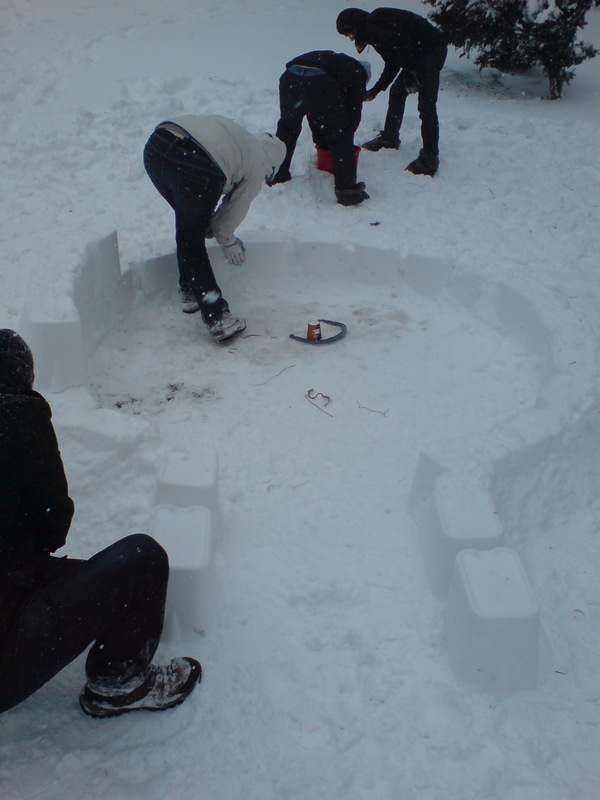 As the overall shape of the structure changes from simple cylinder to something vaguely igloo-like, the most sceptical of the group begin to see the real promise of a completed dwelling. 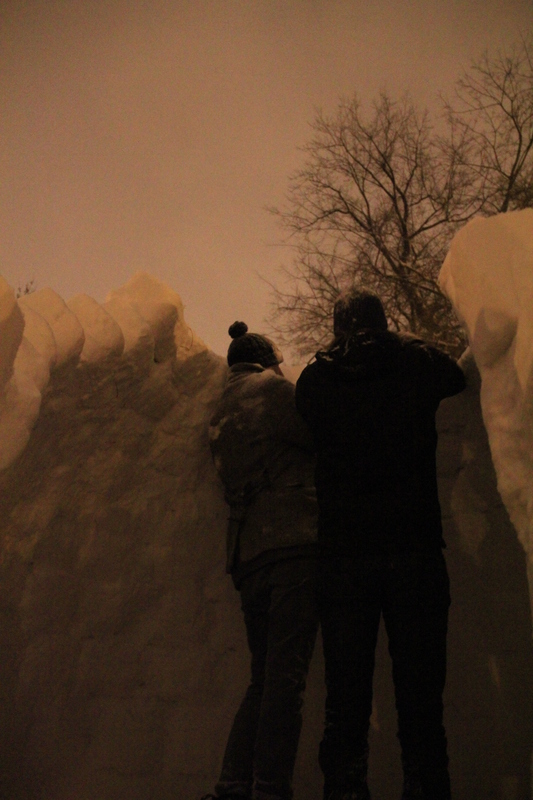 Throughout the build passers-by are both mystified and enthusiastic. 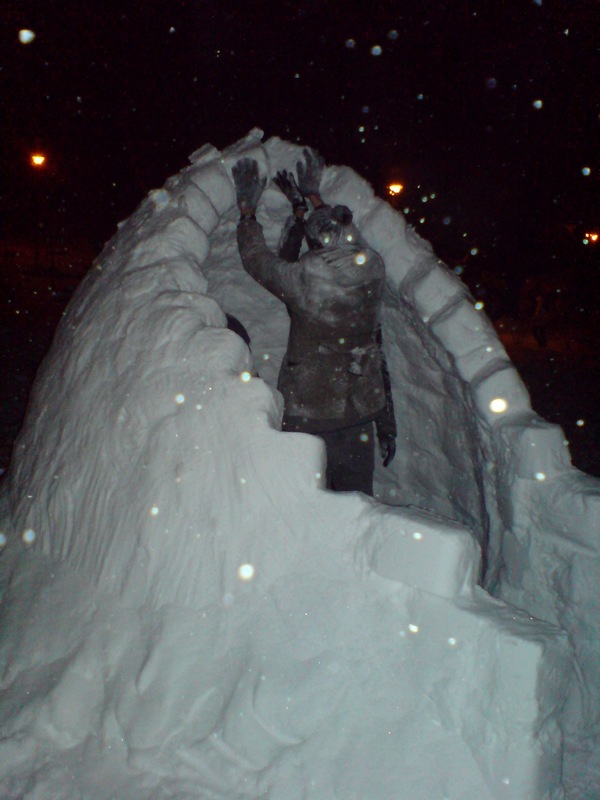 The Igloo becomes a temporary Bucharest celebrity as locals come to have their photographs taken with it, greeting the construction team with interest and encouragement. Inevitably the onset of darkness increases the pressure to reach practical completion. 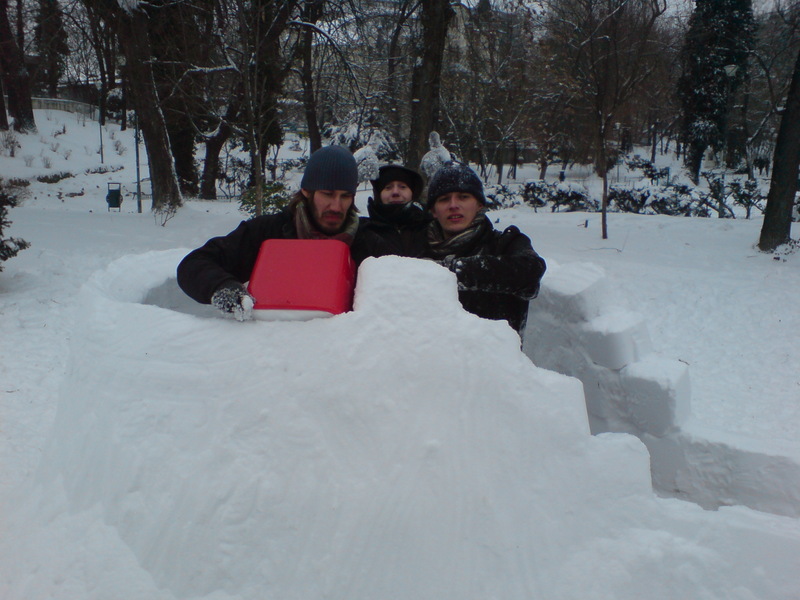 As the temperature drops, fingers and joints become stiffer and dexterity is severely affected but the conditions are ideal for the construction material and bonding greatly improves as the most technically challenging stages of the construction begin. 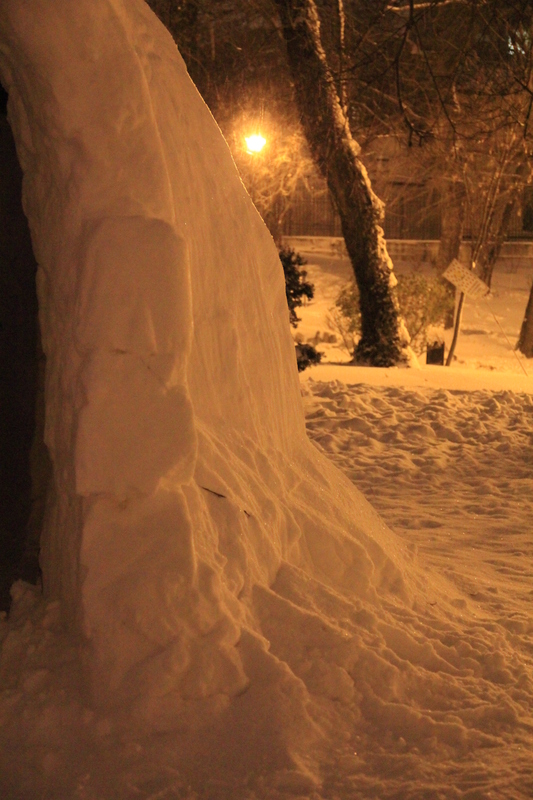 With an increase of pace problems arise, sub-standard building blocks are having to be rejected and inadequate mortaring culminates in a near wall collapse. The event only highlights the need for patience and respect for the materials. As the curvature of the walls intensifies one of the most overlooked trades begins to show its worth, the gentle methodical work of the external plasterer reveals itself as pivotal to the adhesion of the blocks. Working above head height to install keystones is physically demanding and as staff turnover rapidly increases, the passing on of skills becomes a furiously intense process. The construction of an entrance arch tests patience and skill and the experience built-up over the course of the project is invaluable. 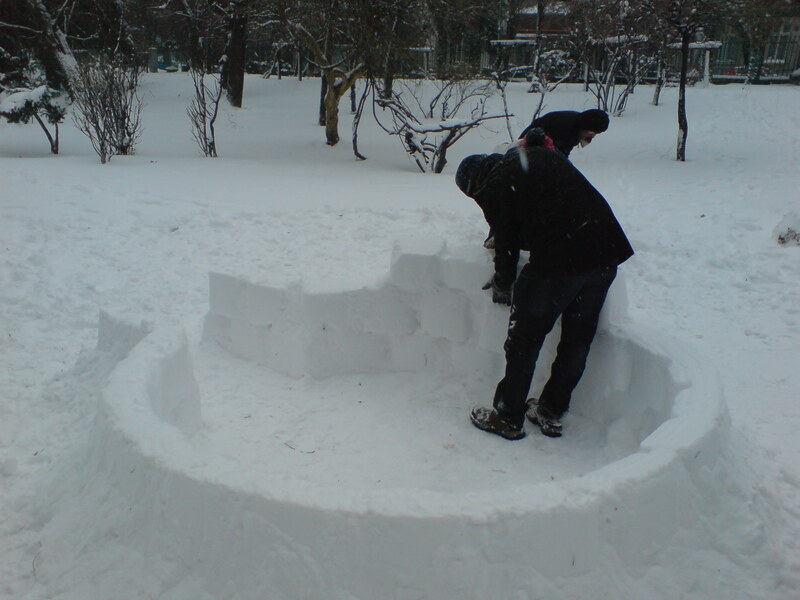 The final task is to connect the arches with the main dome. Being over six foot tall becomes an essential trait as the constructors work shoulder to shoulder holding blocks in place while the mortar is teased into the joints. 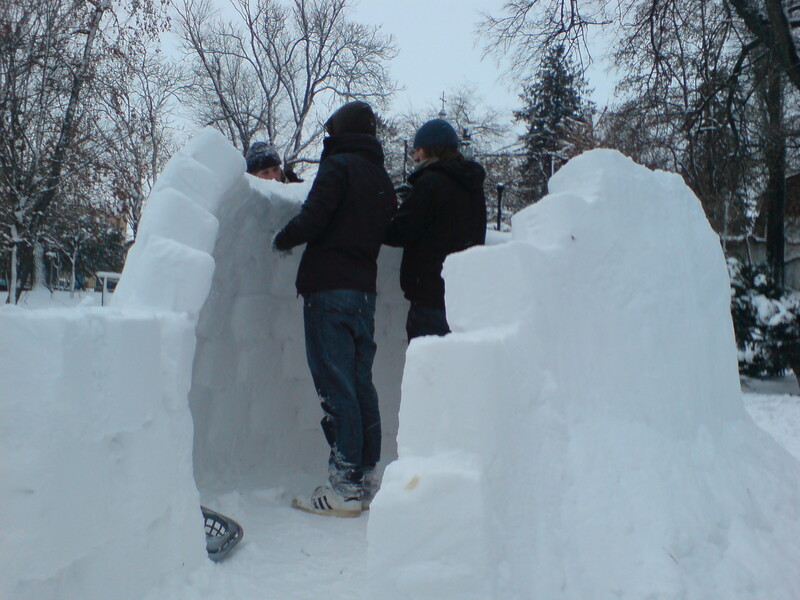 With completion in sight, the structure becomes ever more stable as every block placed seals out the wintery elements. 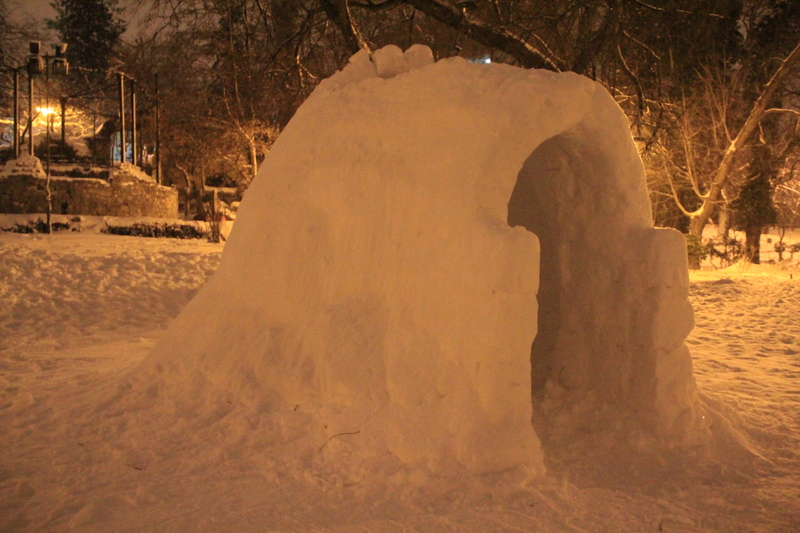 Twelve hours from conception, after eight and a half hours on site, the build is complete, a testament to local materials, the dedication and skill of true craftsmen and the questionable use of spare time by IARD students. 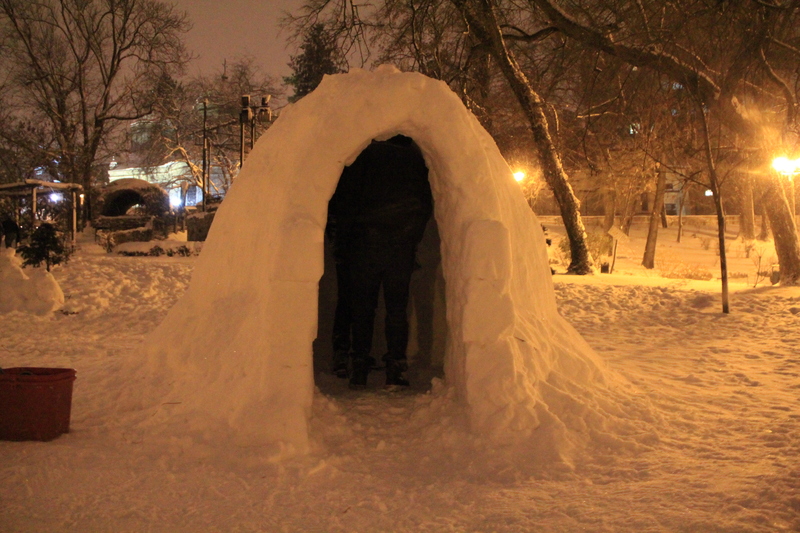 On a freezing January night as snowfall continues in the darkness of Bucharest, an Igloo offers shelter. Not sure why I received this notification of a new post, Trevor, but I did enjoy reading it again!